Note: To see where Shin Godzilla falls in Paste’s ranking of every single Godzilla film, click here. Let me start off this review by saying that I more or less enjoyed the 2014, Gareth Edwards-directed American version of Godzilla, which I also reviewed for Paste. And I’m very much looking forward to the follow-up to that movie, and hope to see more American versions of classic Japanese kaiju. With that said: The only “real Godzilla” will always be the one in the Japanese films produced by Toho Co. There is a feel and a structure to Japanese Godzilla movies that is utterly unique, and instantly recognizable. And so, it was fairly exciting to see Toho return to its most iconic creation, presenting us with limited screenings of Shin Godzilla in the U.S., the first Japanese Godzilla movie in 12 years, since 2004’s Godzilla: Final Wars. What we’ve been given here is a film sporting plenty of unique, unusual quirks for the series, but ultimately one that fits in perfectly alongside its predecessors. To first state the obvious: Yes, this is yet another clean reboot of the entire Godzilla series. The Japanese government in this modern-day film has never encountered any variation of Godzilla before, and are thus completely unprepared. It’s a format of film that we’ve seen multiple times before, first in the original Gojira and then in Godzilla 1985. 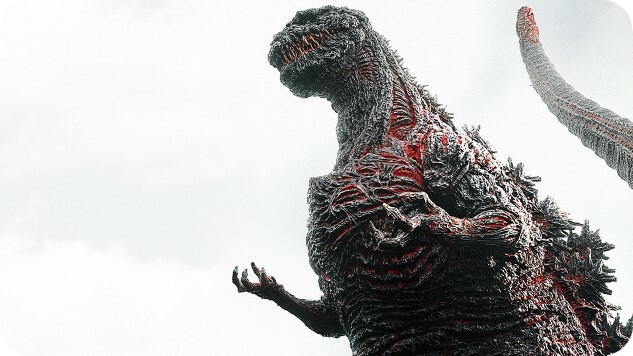 There are no doubt fans who wish that Toho had gone straight into the kaiju-vs-kaiju action that has typified the series in most of its entries, but here they do the unexpected—in Shin Godzilla, it is Big G himself who provides unforeseen variety. No moment better captures that sudden shock than the audience’s first clear look at Godzilla. Suffice to say, he begins the film not looking anything like his usual self. I don’t want to spoil too much, but it’s a moment that legitimately made people in my theater gasp or laugh in surprise. I myself wondered what the hell was going on, until we learn (along with the Japanese) that Godzilla is capable of some pretty startling and near-instantaneous evolutions. Before long, he’s taken a shape much closer to what we expect, although I must give credit to the final Godzilla design as well—sharp, angular and skeletal-looking, he’s one of the most frightening variations we’ve ever seen of Big G. It’s easy to see why fans studying early images theorized that this version of Godzilla was some sort of zombie, perhaps risen from the bones of the original monster destroyed in 1954’s Gojira. As for the execution of Godzilla’s movement, it’s simultaneously innovative but can leave something to be desired. This is the first film in the series where we’ve truly made the leap to primarily CGI imagery, and the importance of that can’t be overstated when we’re talking about Godzilla—this is a series absolutely defined by man-in-a-suit FX. There are moments here that are great in showing off Godzilla’s awesome scope, such as when you see his tail from below, sweeping above entire city blocks. But there are also some odd choices, most notably in his stock-still posture and lack of facial articulation in most scenes. He often feels somewhat sedentary—an unmoving torso locked in place, with only his tail in constant motion. Thankfully, things pick up considerably when the military pisses Godzilla off enough to unleash his atomic breath in what is truly an awesome display. Of course, as in most Godzilla films, the majority of the screen time is actually dominated by the human characters rather than Big G. Here, Shin Godzilla delivers the kind of film that only the Japanese would make, revolving around a nearly endless series of conference rooms, war rooms, politician’s offices and military bunkers. An American studio would never have the guts to attempt the almost Aaron Sorkin-style political maneuvering on display here, and it was a risk for Shin Godzilla, as well. One can almost guarantee that any negative review of the film will center on these scenes for being interminable, without fully grasping their significance or their fairly clever political satire. It helps that these scenes are quickly, vibrantly edited, which makes the fast-paced conversations more interesting than they otherwise would be. Ultimately, they suggest that our overdependence on the system and our concern for political fallout are at least as dangerous to our health as any giant monster. This is the weird duality that makes up Shin Godzilla: Dry, witty, occasionally humorous boardroom scenes that make a very strange, but ultimately effective bedfellow with over-the-top wacky action sequences actually involving Godzilla. The final Japanese plan to deal with the threat is ludicrously complicated in a way that can’t be received with anything other than simultaneous bemusement and applause. This is a Godzilla movie, after all. That’s what these things are all about. Ultimately, Shin Godzilla is plenty entertaining on its own, but Godzilla fans both Japanese and worldwide have got to be hoping this is only the beginning of Toho’s fourth kaiju series. Indeed, the ending of the film gives us a spectacular cliffhanger/jumping off point for another movie to tackle, so presumably it’s only a matter of time, if the box office numbers look rosey. Here’s hoping the next chapter comes along soon. All hail, the King of the Monsters. Godzilla is back. Jim Vorel is Paste’s resident Godzilla geek. You can follow him on Twitter for much more film content.